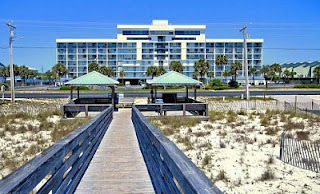 Gulf Shores condo for sale at Gulf Shores Surf & Racquet. Beach Bargain! Floor to ceiling windows in this 6th Floor 1BR/1BA Unit at Gulf Shores Surf and Racquet Club! Enjoy direct Gulf front views and relaxing breezes from the large balcony. This nicely furnished and decorated condo sleeps 4 comfortably. Features include granite counter tops in the Kitchen, a updated bath & tile floors throughout. Gulf Shores Surf and Racquet Club is a unique property situated across the street from the beach on Little Lagoon. The private Beach front directly across the street is for Gulf Shores Surf and Racquet Club owners and guests exclusively. Enjoy the best of both worlds! Fishing, boating, and watching the beautiful sunsets on Little Lagoon from 2 piers. Boat Launch, 1st-come, 1st served boat slips and boat lot parking add to the appeal of this special condominium complex. There is a beautifully landscaped pool with hot tub and kiddie pool, a true tropical oasis. Want to stay active? There are 2 lighted tennis courts and a shuffle board court. Owners may have pets. This is a great income producing property and very popular destination for owners and guests.